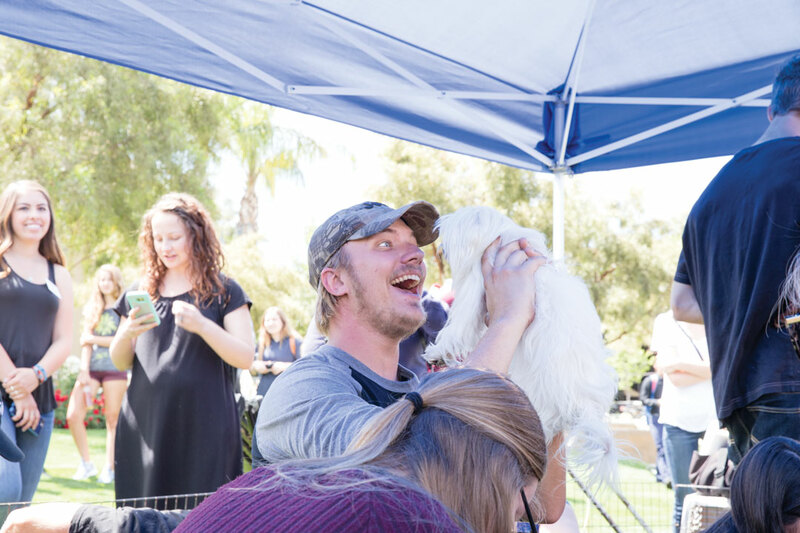 California Baptist University Associated Student Government held the first annual stress relief week, April 24-26, for students before finals start. The activities ran Monday – Wednesday from 11 a.m. – 3 p.m.
Each day consisted of a different activity. Monday had massages, coffee and boba available. Tuesday provided air hammocks and free In-N-Out food. Wednesday concluded the stress relief week with 20 puppies from Puppies and Reptiles For Parties in Torrance, Calif., and different desserts from Krispy Kreme, Kona Ice and Nothing Bundt Cakes. MaKenna Lammons, senior psychology and criminal justice double major and ASCBU president, said the goal for stress relief week was to cater to everyone’s needs. Each of the activities were held in two locations on campus: the Front Lawn and Stamps Courtyard. Kamonie Davis, junior psychology and leadership studies double major, said she went to all the events that were held throughout the couple of days. Students were able to receive free food and desserts throughout stress relief week. Stephan Taylor, junior criminal justice major, said he enjoyed being able to do something fun before finals and In-N-Out including puppies were his favorite parts.